Humidity for red-footed tortoises should be kept at 60-80% which is harder to keep in a tank or open enclosure. The best way to establish this is by using a plastic bin with holes drilled throughout and PVC racks. Aquariums may be used but they are harder to maintain humidity in, unless you cover the majority of the lid with plastic wrap or some type of blocking agent. Using a plastic bin is the cheapest alternative and do work but get a proper bin that will not melt from the heat . PVC’s for reptiles are amazing for keeping red foots. For those who do not know what we mean, here is pictures of PVC enclosures. If you are looking to purchase one of these, please contact us and we can connect you with a supplier. We recommend reptile basics for cost-effective nice setups. Indoor and outdoor Red footed tortoise enclosures setting up a pen like one a Russian, Greek, or Hermann’s would thrive in (open, lots of sunshine, and a hide) is not what these tortoises need and is all too often what I see.In that type of setup keeping the temperature between 70 and 90 degrees let alone the humidity between 70 and 90% is extremely difficult unless you soak it down 5-6 times a day. Your Red footed tortoise enclosures, whether indoor or outdoor, should mimic their natural habitat and have 60-75% of the pen area covered in plants. Plastic ones work best for indoor pens because they don’t get eaten. Check out our beautiful captive bred red foot tortoise for sale selection below. 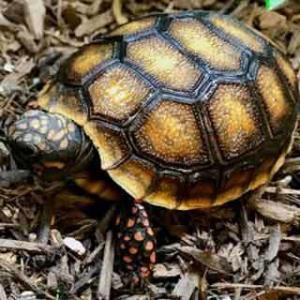 We offer baby red foot tortoise, well started 6 month old cherry head and regular red footed tortoise for sale as well as well started red foot tortoise yearlings for sale. Cherry Head and Regular Red foot tortoises are beautiful tortoises that originate from tropical habitats in South America, including the Amazon basin. Our cherry head tortoise for sale as well as our regular red foot tortoises are raised at perfect temperature and humidity to ensure they have extremely smooth shells without any type of pyramiding. If you are looking for a more colorful baby red foot tortoise, consider the cherry head red foot tortoise. We have some really nice brightly colored cherry head tortoise for sale online. 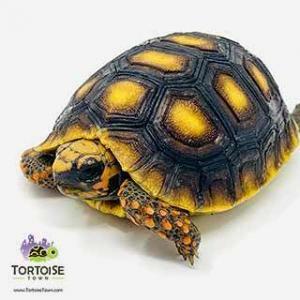 As with all of our tortoise for sale, and baby tortoises for sale, all of our red footed tortoise for sale come with a live arrival and 7 day health guarantee.